Consists of all resources, economic and natural, emanating from the ocean. 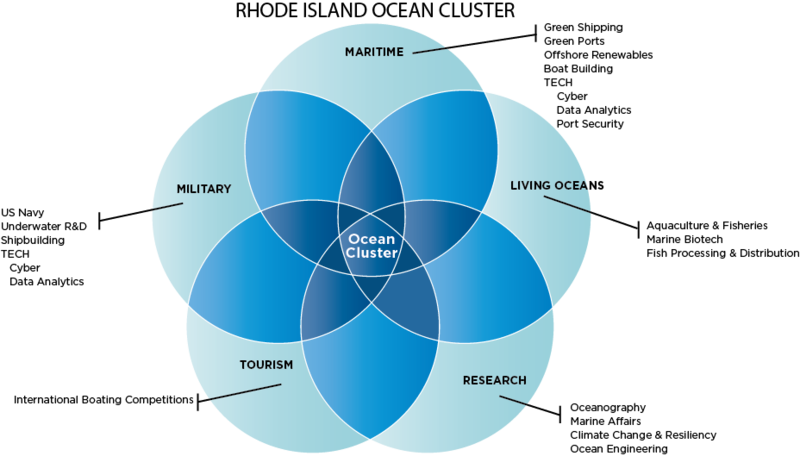 The Blue Economy consists of all resources, economic and natural, emanating from the ocean. This is a fast growth global economy. It’s forecast to double from $1.5 trillion in to $3 trillion by 2030. Rhode Island's Narragansett Bay is a global Center of Excellence for the Blue Economy. Providence, at the northern most point of the Bay, is positioned to be a world leader at integrating advances in research and technology across all sectors of this economy. The Blue Economy is anchored in Rhode Island by a wide range of economic activity. Research from University of Rhode Island Graduate School of Oceanography, Naval Undersea Warfare Center, Commercial Fisheries Research Foundation, and Roger Williams University’s Marine Affairs Institute and Center for Economic and Environmental Development. Supporting the launch of a Commercial Marine Research and Development hub in Providence is key to the region tapping into Blue Economy sectors poised for long term growth. New Economy subsectors in which the region is well positioned to lead include Green Ports, Green Shipping, Offshore Renewable Energy, Technology applied to the Marine Sector and Sustainable Fisheries.